Gonometa Postica 5th instar. Credit: OU/Christopher Holland. 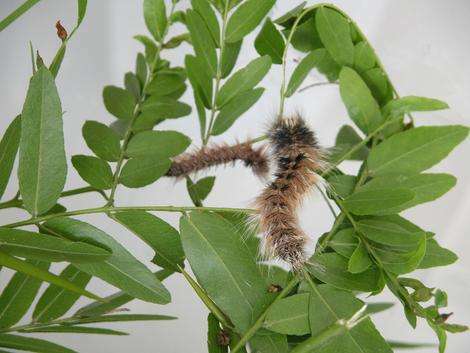 (PhysOrg.com) -- A new way of treating wild silkmoth cocoons could see new silk industries springing up wherever wild silk is found in Africa and South America, as well as silk?s Asian heartland. A new way of treating wild silkmoth cocoons could see new silk industries springing up wherever wild silk is found in Africa and South America, as well as silks Asian heartland. A team led by Oxford University scientists found that the surfaces of wild cocoons are coated with a layer of the mineral calcium oxalate, which makes them difficult to unravel.When the researchers removed this layer using an acidic solution they discovered that it was possible to reel cocoons into long strands of silk comparable to those derived from the domesticated Mulberry silk moth (Bombyx mori). The team publish a report of their research this week in the American Chemical Societys journal Biomacromolecules. The researchers tested their new technique on the cocoons of the wild silkworm Gonometa postica. They found that, unlike traditional methods, their technique, using a warm solution of EDTA (Ethylenediaminetetraacetic acid), softens the cocoons enough they can be reeled like farmed silk without collapsing the cocoon fibres that make them strong and durable. Other wild silkmoth species with commercial silk-producing potential include Antheraea mylitta, Antheraea pernyi, Cricula andrei, and Samia canninggii. Wild Silkmoth cocoons are difficult or impossible to reel under conditions that work well for cocoons of the Mulberry silkmoth, Bombyx mori. Here we report evidence that this is caused by mineral reinforcement of wild silkmoth cocoons and that washing these minerals out allows for the reeling of commercial lengths of good quality fibers with implications for the development of the wild silk industry. We show that in the Lasiocampid silkmoth Gonometa postica, the mineral is whewellite (calcium oxalate monohydrate). Evidence is presented that its selective removal by ethylenediaminetetraacetic acid (EDTA) leaves the gum substantially intact preventing collapse and entanglement of the network of fibroin brins, enabling wet reeling. Therefore this method clearly differs from the standard degumming and should be referred to as demineralizing. Mechanical testing shows that such preparation results in reeled silks with markedly improved breaking load and extension to break by avoiding the damage produced by the rather harsh degumming, carding or dry reeling methods currently in use. I am much more interested in the silkworms engineered to produce spider silk.